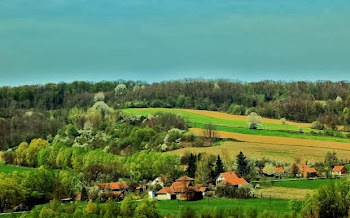 The basic purpose of this article is to take a step back and cover, once again, a region of smaller, simpler places. These are to be found under the heading of Hamlets. While these type of posts may not be as prominent in importance or of quite as serious an interest for the majority of visitors, they are picturesque and nostalgic while offering a clear path into the average community in times past as well as our modern age. Such realms exist as the true heart of a bygone American culture and its special traditions. These villages took on a very insular yet meaningful existence worth learning about and remembering. Those that often spent most of their precious lives growing up, getting married and raising their children in a rather special, cloaked, rural environment are sometimes here recalled to memory. Although it may be only a minor issue, I had planned to include more research material, but needed to get the new Fayete/Westmoreland Forgotten History post uploaded. In other words,"it is what it is." It is to be hoped the subject will still be of some enjoyment helping lead to an educational experience. Thanks for your understanding and continued support! 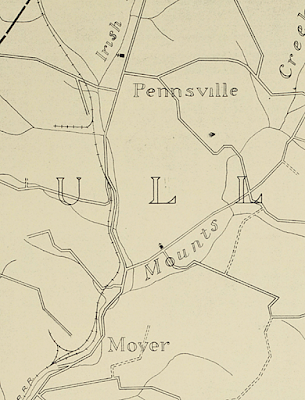 Pennsville, the oldest village of Bullskin Township going back toward the late 1700's, is situated on the Mount Pleasant Road, sometimes called 'old 119.' There were lots sold off years ago from the Cochran and Strickler farms and it is still a small village of a few dozen or so houses and a handful of stores near Crossroads. Like many an old mining community, there was once a post office kept by David Shallenberger, while it had its a general store or two and the odd tavern and an inn kept by Adam Frazer, which served as the office of the bustling stagecoaches. In the earliest days the first store was run by John Strickler, in what was called the "present Miller stand." Other merchants included: the Overholt's, Bougher's, Newcomer's, Rice Boyd and John Campbell. 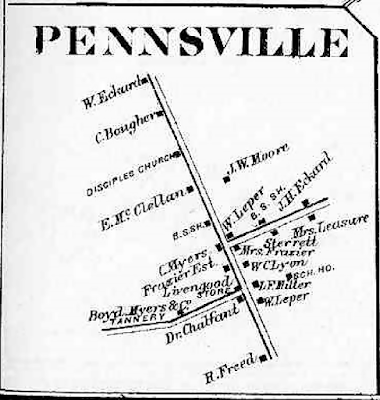 According to most information which is admittedly somewhat limited, the Pennsville Mine was located near the exit of Rt. 119 in Pennsville and west of Everson. As far as can be discovered, and as would be expected, the coke ovens were near the railroad and some were none too distant from Sherrick Rd. Photos are scarce, (particularly at this time of year for any coke oven remnants). According to G. D. Albert, in 1881, along with other properties, the Tintsman's bought the Pennsville Coke-Works and owned them for some time. 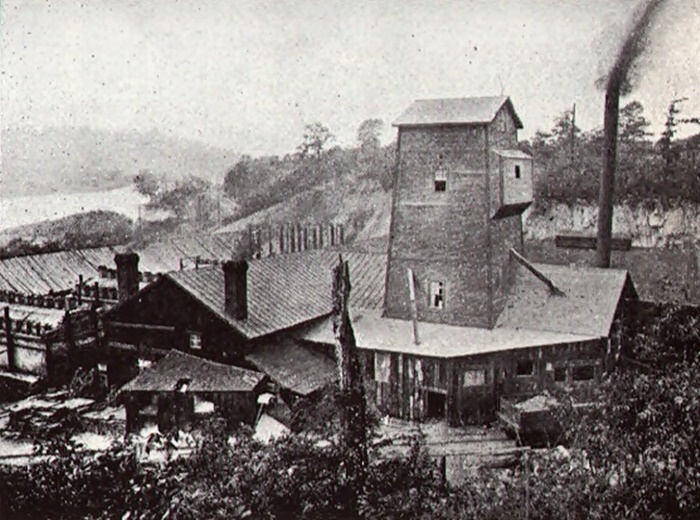 In 1890, the mines were run by J. D. Sherrick with J. F. Dillinger, who was one of its superintendents. Near the turn of the last century, the Pennsville Coke Company had nearly 100 beehive coke ovens. In the late 1800's and early 20th Century, all through this strip of land existed many groups of mines and coke ovens accessed by the railroads. 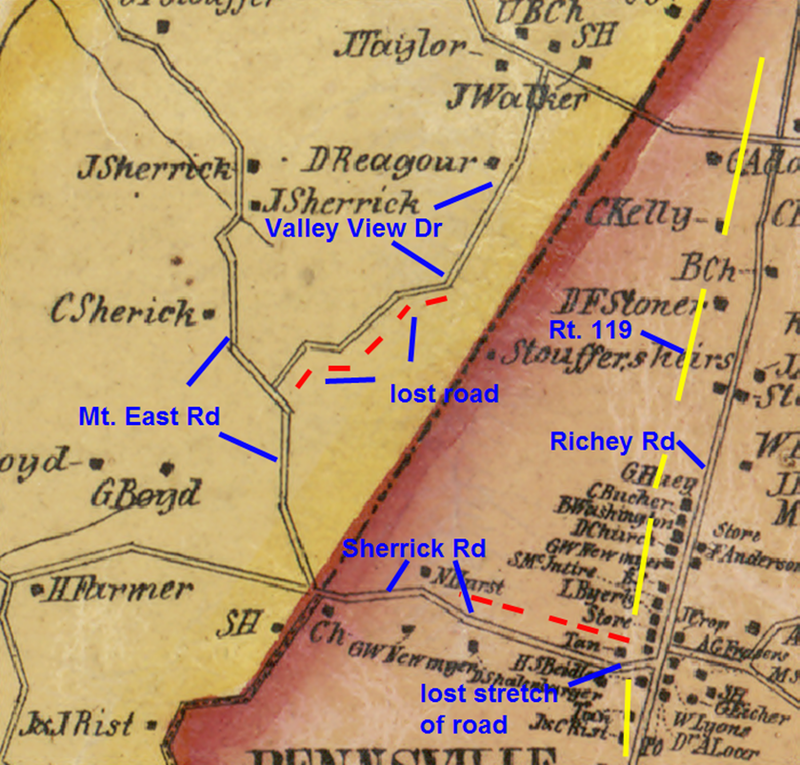 On the map above are added highlights giving a basic representation of the loss and changing of a few Pennsville road ways from the 1800's. This is especially the case from the creation of Route 119 which is shown in yellow: The road between Valley View Drive and the Mount East Road which has not existed for some time is referenced in more detail with extra information on a link below. Possible mine locality near Rt. 119. Everson Rt. 118 overpass in Pennsville. Pennsville looking to the west. The houses of reverent worship included Pennsville United Methodist Church, from 1895, once the "Little church on the hill." It was remodeled somewhat with better brickwork in the mid-1940's and again later with white siding. Further toward east on the border with Upper Tyrone was the Pennsville Mennonite Church. Ground was broken for a log meetinghouse ministered to by Abraham Stauffer with a burial ground in the mid-1790's while there was also a schoolhouse. By 1903, a later brick church was removed and all that was left to examine for posterity is the Alte Menist cemetery. I referred to the site some time ago on a post researching the Lost Cemetery on the Braddock Road. Finally, last but not least, is the Pennsville Baptist Church across the Richey Road from the Methodist going back to the forgotten era of the very early 1800's. The name then was the 'White Meeting House'. More on that further on. It is said there are over 700 people who attend the church in modern times. In the Pennsville Mine region. The coke ovens to the west of the railroad became few in number. This stretch of Richey Road approached a once populated locality of the village. The modern 'end' of Richey Road. All the information I've gathered concerns the claim that Bushrod Washington had purchased land said to of once belonged to one 'George Washington'. Or, so his name was attached to a property by tradition, in Pennsville, within the confines of Bullskin Township, Fayette County, Pa. Early on, plots originated from land sold off from the Cochrane and fairly extensive Strickler farms. If, indeed, he actually lived there and for how long, is debatable, even doubtful, for all that. Nevertheless, a snippet of "Fayette County Survey of Boroughs and Unincorporated Townships" stated that this nephew of George Washington put up a house near the Disciple's Meeting House in Pennsville, near the later Baptist Church in 1848 as did Henry Shallenbarger; although the details appear unlikely, unless we are dealing with a relative or a murky recollection. Bushrod was noted to of passed on by 1828. The idea may be an interesting one, yet hasn't been researched extensively as far as I am aware. On one hand, while it is true that Supreme Court Associate Justice, Bushrod Washington, the inheritor of the famed Mount Vernon estate in Virginia, who was known to have lived much of his later life in Philadelphia, Pennsylvania - it is indeed a novel concept as as assertion of fact on supposedly good authority that he actually lived anywhere close to the area in question for any amount of time, especially at this late date. It is feasible the main claim originates with historian Franklin Ellis, at the old White Meeting House among such attendees as Jacob Lobengier, Christian Shank and Andrew Rees and his wife, was none other than Bushrod Washington! I thought some of you might find that a fascinating consideration, as did I, especially under the circumstances. Moyer is a small community roughly 2 miles south of Connellsville not very far from the boundary line between Upper Tyrone and Bullskin townships. There was once the Progressive Coal Co. among others, and are still a few other businesses like Snyder's Automobile Garage and the U-Haul establishment that I myself used when moving almost four years ago. The village of Moyer held what was in some respects a larger operation than that at Pennsville, since in 1880 feasibly near its peak, Mt. Pleasant's native, John Moyer, built up the Grace works which had over 400 coke ovens. Moyer also had the Eldorado Coke Works which may be directly related to those previously mentioned. For comparison, this was as many as the Morewood operation and roughly half as many as the very large volume of ovens at the Standard Works in Mount Pleasant to the north. While most of these mines and ovens were no longer functioning by the middle of the last century, some, like Leisenring No. 2 with the H. C. Frick Co. still had 500 coke ovens, while Central maintained 300, and Standard held at 277 by 1956. Railroad tracks leading toward the coke ovens. On a personal note, I found that my great grandmother, Mary (Miner) Wilson, who at the time resided in a corner of Pleasant Valley up Rt. 982 from the Moyer region. She once owned land near the Kells Schoolhouse where the Bullskin Township Elementary School sits today. This was listed as in Moyer. I believe the property was subsequently sold in the 1940's. Beyond this, a relative of mine with a sharp memory for things of this nature has brought to my awareness that my grandpap, Meryl Wilson, who while I was young and for many years previous, resided at Wooddale, said he had a job as a bricklayer, at the once busy Moyer Station. My brother also informs me of the family tradition that he did most of the work himself. This was undertaken for the price of one cent a brick; this was probably a tidy sum in those days. They Soisson Fire Brick Co. was operated at Moyer Station which was the main hub of the area, across from Sheetz. This establishment was on the same side and below the old Blue Ridge Restaurant, now a small, self-serve gas station. 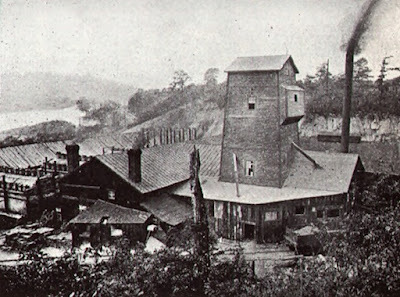 The company was also known as "The Southwest Fire-Brick Works" according to Franklin Ellis' in his book, "History of Fayette County, Pennsylvania" and his year for completion is 1871. Seventeen employees were under the supervision of Anthony Sourd. With 4 ovens, they had the capacity of producing eight thousand fire-bricks daily; quite enough to build a good house! 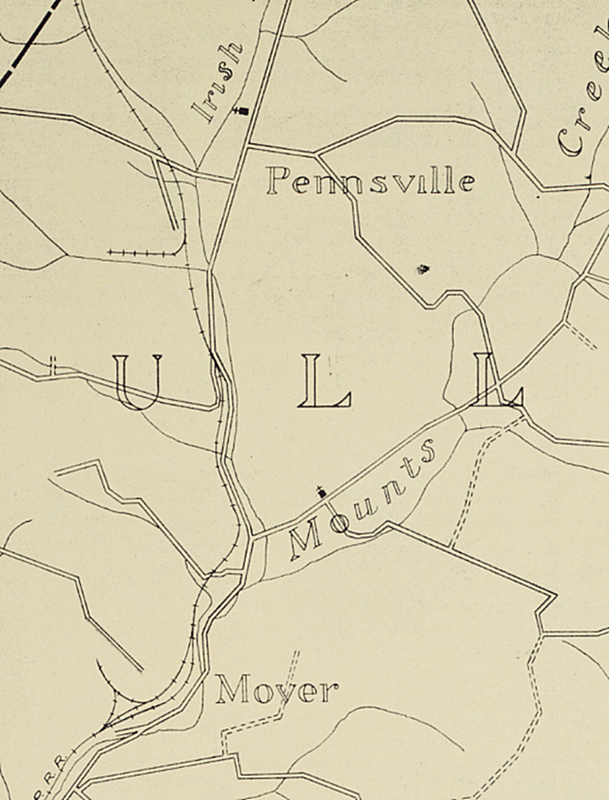 Moyer itself is just below the hills which are blocked in by what was the Southwestern Pennsylvania Railroad, now operated by Conrail. The location lies along the four lane of Rt. 119, by Irishman's Run. Of the many small, quaint railroad stations nearby were, Broadford, Tintsman's, Everson, Fountain Mills, (or Scottdale), and West Overton. That is just a few of the closer ones. In 1932, the Soisson Brick Yard was up for tax assessment for being delinquent of a whopping $355. It was owned by Joseph Soisson, who, along with Worth Kilpatrick, had built the majority of the works. I'm not positive of whether it was sold at that time, but it seems likely. There were many coke ovens, in fact, many of the old ovens are still there. I have a photo (somewhere), but I hadn't located this yet, so I took a picture with so many trees that,I'm afraid the view doesn't show any! Regardless, fire-brick was manufactured in Fayette County as far back as 1830. Much of the brick was either loaded onto railroad cars or transferred to flat boats and floated down the Yough River to the Pittsburgh area for use in coke ovens, furnaces, and mills. There are various compositions the bricks could be used for with two basic types: plastic (or soft) clay of a hard, fine grain, and flinty (or quartz) clay, which is more pliable. The material was placed in metal pans and while rollers were surrounding the clay, streams of water were aimed at it with precision to produce the required consistency. It is then taken out and molded and heat-dried. Afterwards the bricks are burned in kilns up to five days and are ready for market. On the above photo of the brick works can also be seen the coke ovens in the background. An a major point of interest concerns both villages with their mines and coke ovens this is the basic thrust of info provided which may not be all that surprising, considering the underlying geography of the Connellsville Coke Seam throughout so much of this region.